I usually pull up a chair for him to stand on while I prep ingredients. 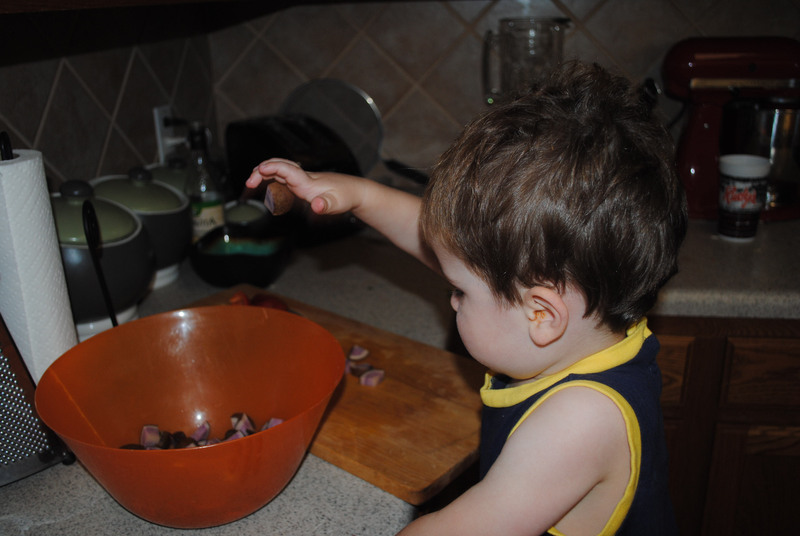 He knows that only adults can touch knives, and reminds me each time I use one that they are “very very sharp” and can “give you owies.” Once I’ve chopped everything up, I let him put ingredients into a bowl and/or stir them together. 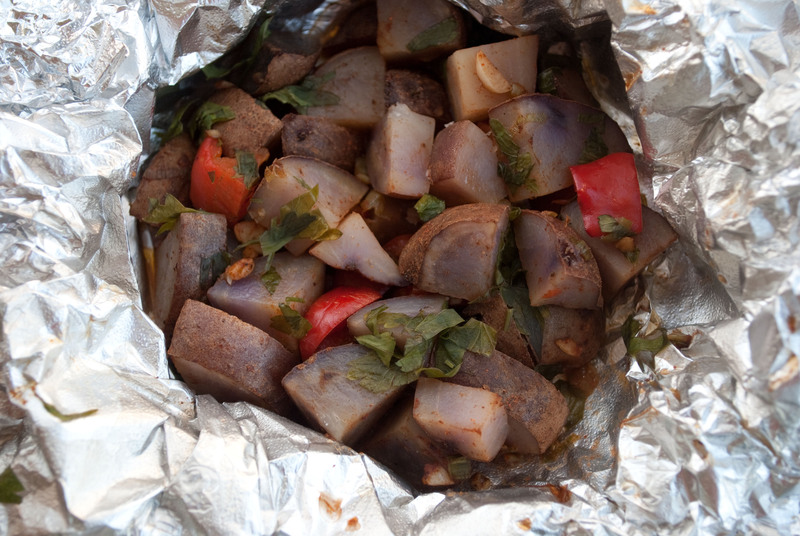 For this recipe, which involves dividing the potato mixture into four parts and putting each part into its own foil packet, I also let him spoon the mixture onto each piece of foil, sprinkle with parsley, and put a dab of butter on top. Sure, maybe he insisted on putting one potato piece at a time into each packet. And maybe it took much longer than if I had done it myself. But he loves cooking, and I love that he is excited about it. Plus, it’s nice to be able to channel some of that toddler “I do it!” mentality into something constructive. Anyway, this recipe only uses a few ingredients and is easily customizable. I used parsley because I had some, but I’m thinking a rosemary/thyme combo would taste great. If you have some of those individual foil sheets (like these), they work perfectly here. If not, use pieces about 12″x12″ so that you have ample room for the potato mixture. Preheat oven to 400 degrees. Combine potatoes, garlic, bell pepper, and green onions in a bowl and season with salt and pepper. Place 1/4 of the mixture onto each of four foil sheets. Top each with a sprinkle of parsley and teaspoon of butter. Draw up the sides of each foil piece and pinch at the top to create a packet. Place on a baking sheet and cook about 25 minutes, until potatoes are tender.